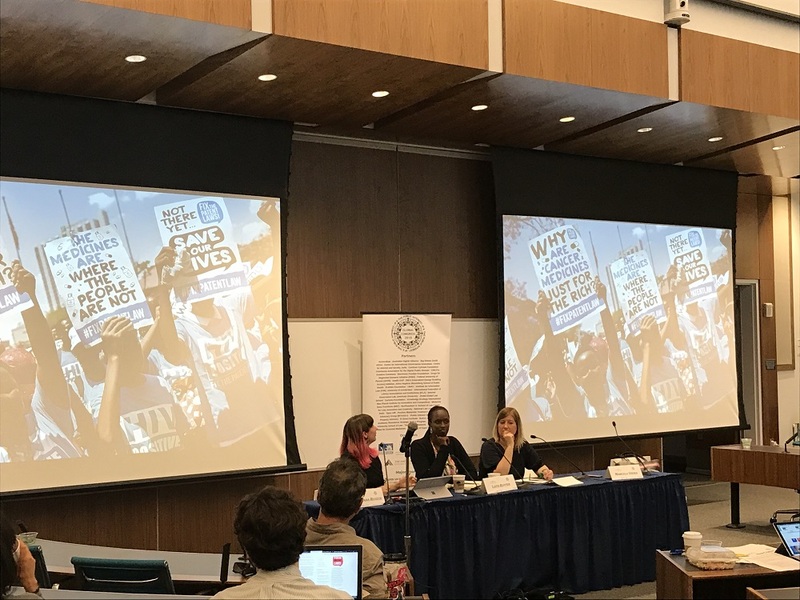 The Congress featured three concurrent, but interconnected, tracks centred around copyright user rights, access to medicines, and trade. A list of the many panels, workshops and other events of the Congress can be found in the event agenda. Key themes that emerged from the plenary sessions of the Congress include the need to take a critical look at the association between intellectual property and development, the important roles that both IP activism and academic research play in shifting practice, and the complex tension between pursuing incremental IP reform in the short-term, while envisioning and building toward IP system change in the long-term. Participants were asked by organisers to contribute statements and to vote in an online poll to chart and map participant perspectives at this year’s Congress. The interactive results of the poll can be viewed here. Intellectual Property Watch followed the access to medicines track throughout the Congress, to develop a broad picture of the persistent challenges and new strategies in this field, and to identify key initiatives to feature in the coming months. Below are some of the themes that emerged over the course of the sessions, along with key highlights. Some participants highlighted their countries’ use of compulsory licensing to reduce drug prices and to maximise health budget capacity, with notable examples from Ecuador, Chile and Malaysia. Participants identified that many other countries, however, are not taking full advantage of these flexibilities, which can be partly attributable to a lack of awareness regarding these flexibilities, and a lack of systems to employ them. They noted that this is often compounded by IP-centric technical assistance that frames strong IP systems as necessary for development. Many participants argued that compulsory licensing, along with other intellectual property flexibilities, should be fully normalised, and that IP law should be structured to maximize the use of these flexibilities, rather than treat them as exceptions. Some also argued for the institution of international or regional coordination mechanisms for compulsory licensing. Many participants, representing activist organisations working for access to medicines, noted that their campaigns were largely focused on the price of a particular drug in a particular country. Pursuing access to medicines on such a piecemeal basis, they explained, does not produce sustainable change within the IP system itself. This, they noted, is a similar challenge faced when issuing compulsory licences. Participants explained that pursuing strategies based in competition law could perhaps offer a more sustainable solution to address excessive pricing across a range of drugs. This strategy, they explained, could move forward key legal reforms to systemically challenge pharmaceutical monopolies and bring about more competitive drug pricing. According to participants, the term innovation infers a particular narrative, similar to “intellectual property,” and has been used by industry to justify the pharmaceutical patent system. One participant explained that patents are currently being granted on the basis of utility, rather than real inventiveness. He explained that the term innovation has come to represent the industry-led process of shaping markets and cycles of consumption, and that therefore, we need to reconsider our use of the term. Many participants highlighted the dysfunction of the current monopoly incentive system for pharmaceutical research and development, and advocated for other systems such as delinking the price of pharmaceuticals from the cost of research and development and the volume of sales. Others highlighted examples of how drugs for neglected diseases can be developed and manufactured without intellectual property incentives, and still others how drug licences can be efficiently pooled to facilitate widespread generic drug production. Another participant further illustrated the dysfunction of the current system, noting that much of the research and development of patented pharmaceuticals was publicly funded, and that there needs to be greater public accountability in drug pricing. One important perspective, expressed by participants across tracks, is simply that medicines should be non-patentable and accessible to all people, without restriction. Intellectual Property Watch will feature some of the key access to medicines initiatives highlighted at the Congress in greater depth and detail in the coming months. The First Global Congress on Intellectual Property and the Public Interest was held in 2011 at American University Washington College of Law in Washington, DC, and the specific policy goals of the Congress were summarized in the 2011 Washington Declaration on Intellectual Property and the Public Interest. The Congress was subsequently hosted in 2012 by Centro de Tecnologia e Sociedade of FGV Direito, in Rio de Janeiro, Brazil, in 2013 by University of Cape Town IP Unit, in Cape Town, South Africa, and in 2015 by the Centre for Internet and Society, in New Delhi, India. Intellectual Property Watch has attended them all. More background information on the Global Congress on Intellectual Property and the Public Interest can be found at infojustice.org. "5th Global Congress On IP And The Public Interest: Successes, Strategies Highlighted" by Intellectual Property Watch is licensed under a Creative Commons Attribution-NonCommercial-ShareAlike 4.0 International License.